The Raith Rovers boss admitted that his players have failed to match East Fife’s desire in the previous meetings this season, with the Methil men boasting an unbeaten record after two wins and a draw. Rovers’ wounded bragging rights were given a boost by January’s Scottish Cup win over Dunfermline, and McGlynn is looking for a similarly committed performance at Bayview this Saturday. “I’m a great believer that in any derby game, no matter what football club, the team who wants it the most wins,” he told the Press. “Unfortunately, we’ve been found wanting in that department – there’s no other way to put it – but we have to overcome that. “We want to right the wrongs of the previous games against East Fife. “Since we played them last we picked up a really good derby win against Dunfermline, so we know we can win derby games, and that has to give us belief and inspiration. League leaders Arbroath will have one eye on events at Bayview as a defeat for Raith would hand them the chance to clinch the League One title with victory in Forfar. For McGlynn though, the focus is on retaining second place and addressing the team’s poor away record. “You’re scratching your head away from home because we don’t do anything different,” he said. “Our mind-set is to go out and win every game but away from home we just don’t get a break at all. “At times we haven’t played badly and still been punished. “There was nothing in the game against Forfar, and I don’t think we deserved to lose, but the stats tells you that away from home is what lets us down. McGlynn is hoping for a continuation of the standard set in the 4-1 win over Dumbarton, with Hibs loan striker Jamie Gullan singled out for his performance at the tip of the midfield diamond. “We watched him in the Hibs reserves and saw he could play in different positions, so we didn’t have any hesitation about going that way,” he said. 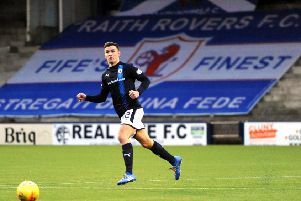 McGlynn also reinstated Ross Matthews after a number of weeks on the sidelines and the midfielder repaid him with the opening goal in an all-action performance. “Ross has got great energy, and Jamie Barjonas as well showed more of that on Saturday, “ he said. “We had a lot of legs in the midfield area, and a lot of tenacity. “The work-rate was right up there with any teams we’ve had in the past, who’ve gone and worked their socks off from the first minute to the last. “There’s no doubt that is what we’re capable of. Rovers could be without five players for the derby showdown with Nat Wedderburn rated 50-50 after picking up an ankle knock in the win over Dumbarton.